A film by Lesley Chilcott (producer of An Inconvenient Truth and Waiting for Superman), the CodeGirl documentary aims to inspire more girls to pursue their interests in STEM and entrepreneurship. The film follows teams of girls globally during the 2015 season. Every year, Technovation challenges girls all over the world to build a mobile app that will address a community problem. Since 2010, nearly 5,000 girls from 60 countries have submitted a mobile app to Technovation. Follow the film at @CodeGirlMovie and the program at @Technovation. Meet five young women determined to pursue their start-up dreams. She Started It is a documentary by Nora Poggi and Insiyah Saeed following Stacey Ferreira, Thuy Truong, Brienne Ghafourifar, Sheena Allen and Agathe Molinar over the course of 2+ years, illuminating the ups and downs these entrepreneurs face in building new businesses. The film is raising funds. Follow the film at @SheStartedIt. Software engineer Gulnara spends her free time working as an actress, writer, director and producer. She wrote the_developers, a web series about three different young women who are trying to make it in the tech world in San Francisco. She is currently raising funds for the 5-episode pilot series. Follow her on Twitter at @gulnara and the show at @the_developers_. CODE: Debugging the Gender Gap exposes the dearth of American female and minority software engineers and explores the reasons for this gender gap. Directed by Robin Hauser Reynolds, the film raises the question: what would society gain from having more women and minorities code? Follow the film at @codefilm. Go Against The Flow is a documentary about successful female entrepreneurs from the US and UK, sharing their hard-learned lessons from starting companies like Cloudflare, Getaround, Kabam, Zinepak, Mightybell and many more! Help fund the Kickstarter for this documentary. Follow the filmmaker at @charu1603. This list was compiled by Angie Chang at Hackbright Academy, the leading engineering school for women. Inspired by the women on this list? Learn more about how to become a software engineer through our 12-week fellowship program for women. New to code? Check out our Intro to Programming class. Looking to hire brilliant female engineers? 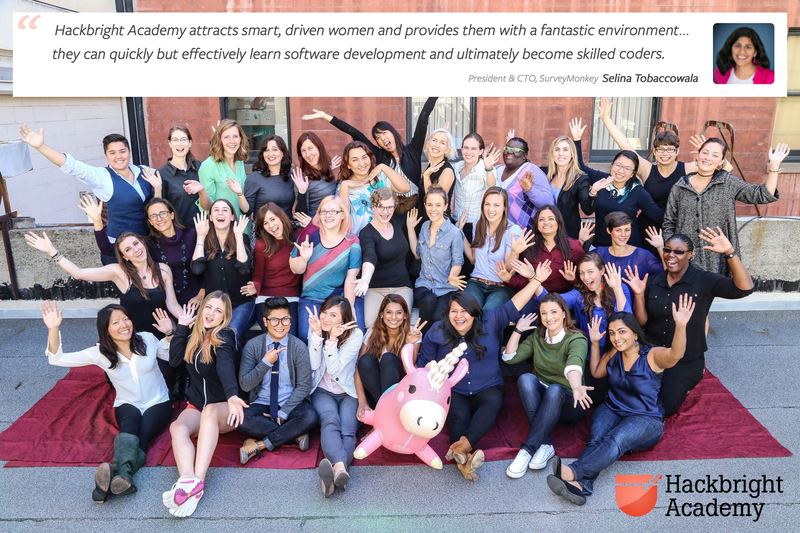 The next opportunity to recruit from Hackbright Academy is December 1 in San Francisco – you are invited to recruit/partner with Hackbright Academy!